Hello, my friends and fellow prayer warriors, and thank you for coming to this week’s Prayer for the Week Post. Today, I thought I would discuss with you how hard I sometimes find it to pray, and how I am looking at two different styles of prayer that might help you if you find praying hard also. 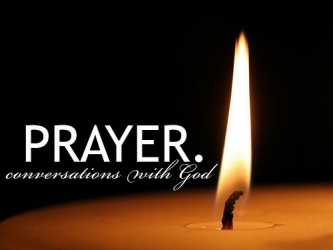 The first style of prayer is called conversational prayer, and the way I understand it, it is the process of praying by just having a conversation with God. Just tell Him you are here, what’s on your mind — almost as if you are talking on the phone with your best friend — which, you are, if you think about it. I think I sometimes get too caught up in the formality of prayer, using phrases like Heavenly Father, and so forth. Instead of saying Heavenly Father, sometimes I just say Dear God — doesn’t that work just as well? Adoration — telling God how much you love Him. Confession — Confessing your sins to God and asking for His forgiveness. Thanksgiving — Thanking God for all of your blessings that He has given to you. Supplications — Praying for the things that you need and also the things that others need. surrender — Surrendering to God’s Will — usually I close with the Lord’s Prayer at this time. Both of these styles are effective, I think — especially if you are finding yourself having trouble in your prayer life. Give it a shot! Now, let’s lift up all of the prayer requests and praises we have for this week. My friend Dawn left a prayer request on Facebook. Here is what she wrote:Prayers for my Dad. His cancer moved to his spinal cord. UC Davis is starting him on a clinical trial and a new round of chemo on Monday. He did well during the summer with the chemo but just not sure how well he is going to do with this round. Trying to remain positive. Lord, please hear the Healing Prayers directed towards your Servant so that he may beat this cancer. Please provide your Peace, Comfort, and Strength to him and his family as they struggle with what the future might bring, and please remind them that You are there for them and will take care of them in the good times and in the bad times. We ask these things in the name of Your Son Jesus with Thanksgiving. Amen. Please pray for my friend Bambi. She has a surgical procedure tomorrow at 5:30AM (Friday, December 6, 2013). Please pray for God to look after the skillful hands of her team, and heal her of her afflictions, and speed her recovery. Please also pray for peace for her husband Ricci and their two children and all their other family and friends.Thanks, everyone! I’ve had an update on Bambi from her husband! Thank you all for praying for her, here is what he wrote on Facebook:Well bam is outta surgery and in recovery now, just got off the phone with dr, they saved 70-80% of her kidney. Will be about another 2 hours before we go back to see her. All in all, the recovery for Bambi is going pretty well — she is in some pain, but she is making strides each day. My friend Teresa has a prayer request. Here is what she wrote on Facebook:Such a sad night for me. A very special and dear friend passed away tonight. If there are angels in heaven she truly is one now. Rest in peace Margie Pooh… you will always have a piece of my heart. Please pray with me, Christian Prayer Warriors! Lord, we pray this in the name of Your Son Jesus, who died for us, so that we might live, with Thanksgiving each and every day — even today. Amen. We have many blessings in our lives, and one of them is the love we have for Stephanie and Shane. They were able to hang out with us for a brief moment on Friday before they drove home, and it was a good time. I am blessed with the love of my wife Cindy, and my daughter Sophie. Thank you Lord for these incredible blessings! Today I am blessed in that I am helping coordinate the Ordinary Houses of Prayer that I talked about previously. Today we are having a training with the families that have agreed to open their homes for our Ordinary Houses of Prayer, and I am blessed to be able to help these couples pray for God’s Will for our campaign! Thank you all for stopping by today and during the week and praying for our requests. It is a big deal, and I thank you all for doing so. May the Lord bless you and keep you safe this week! Amen.